Belated Happy Anniversary wishes. I hope you have many more happy, successful years together. Love the embroidery stitching you did on te bag. Was this done with an embroidery unit, or is this decorative stitches that you have sewn on yourself? I am trying to use some of the decorative stitches on my machine, but my stitches don't look neat and pretty like yours do. Do you do anything special? Thanks for posting the cute bag. I hardly ever do anything with the decorative stitches on my machine, so keep those great ideas coming! I agree with the comment above and am now inspired to use my decorative stitches. May I ask what type of fabric you used on that cute bag? Is that linen? or some type of canvas? I'd love to know where I can purchase some. swim(dot)usn(at)gmail(dot)com. Thanks a bunch for the fun posts! Congratulations on 15 years with your best friend. Your bag looks great. I really need to use my decorative stitches more. 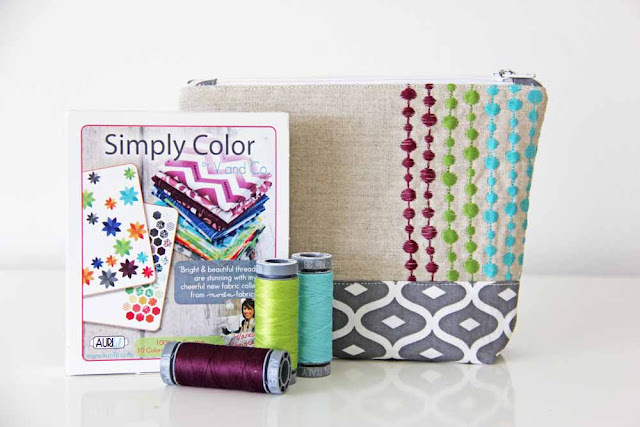 Do you know anything about the 6 stand Aurifil thread? I would like to try it but with shipping it costs an arm and a leg. Oh I love how the embroidery makes this cute bag very special! And who can resist Aurifil, my Bernina loves it too. Looking forward to hearing your story, you often make me laugh hard enough to pee too...the mens's room! Congratulations on 15 years of marriage! And I love the embroidery! Beautiful bag! And congratulations to you and yours! We just celebrated 12 and I feel so blessed to be married to my best friend too. You should definitely share your story with us, you are SO hilarious! I recently had a son at church in a similar predicament as yours and I HAD to send my husband in after him remembering your tale... SO FUNNY! Does that make me a bad mom? Love the bag ~ machine embroidery is so much faster than hand ~ always forget about it. Happy Anniversary ~ 15 years is wonderful! and thank you to all of you for your lovely comments on our 15 years. linen was used for the top part of the bag, i also used interfacing to keep my stitches from bunching as well as it helps with the shape of the bag! bought mine at my LQS! What a lovely bag! Zippy pouches are the best gifts aren't they! I look forward to your story about you and your husband, I'm so curious now! Congrats on your 15 years and one month! 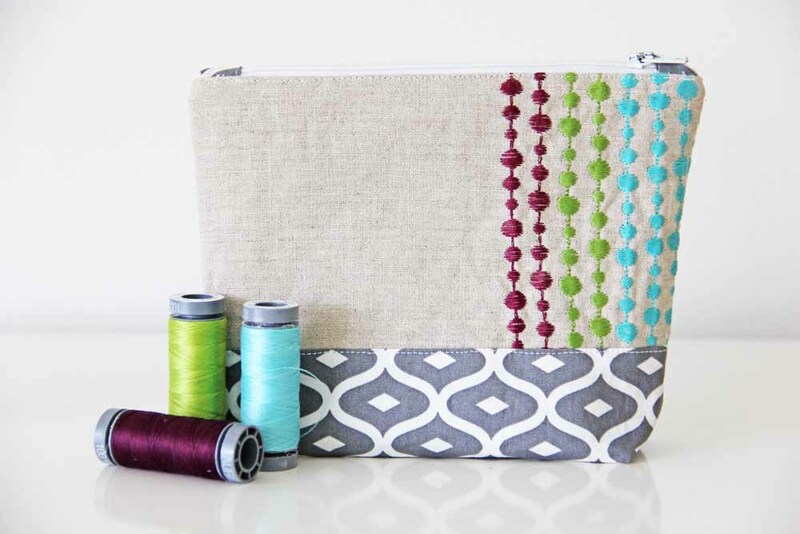 Another reason to lust after a Bernina 580 - what a gorgeous pouch and I love the colours. Aurifil is difficult to find here in Australia but you have so motivated me - I love the sheen. Love all your work, Vanessa - and I always get lots of great ideas when I visit, Thankyou for blogging! Congrats on 15+ years with such a wonderful person... BOTH of you! You sound like a really fun person with a pretty cool family, someone I'd like to meet some day. Keep up the great work! You are so adorable. You just made me cry with your beautiful words about your husband. Something for us all to aspire to. Love the personality photo of your microphone eater too!